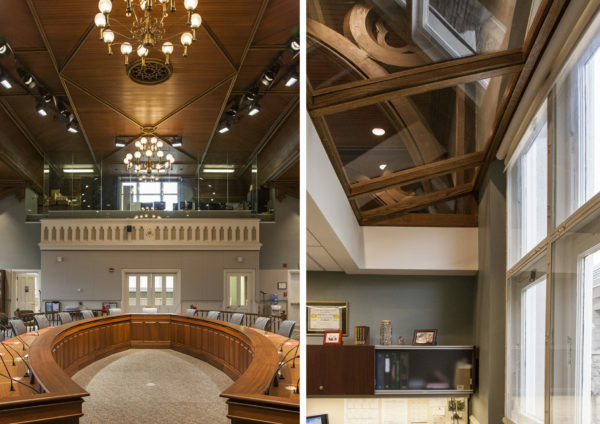 This historically sensitive renovation transformed a 1854 double-height courtroom into a 21st Century public assembly space for the Tompkins County Legislature. The renovated facility includes a central 16-seat Legislature horseshoe meeting table, several semi-private staff offices, ancillary meeting spaces, public seating for over 40 persons, and sophisticated acoustical, lighting and audiovisual technology. Interior windows and sloped glass office ceilings allow for borrowed light to be shared by all occupants of the space. The Legislature’s new, vibrant chambers have allowed for a more collaborative, efficient, and inclusive assembly/work space that welcomes both the public and staff into an intact local historic landmark.